There is a code in the Swidget! Every once in a while, you should check the Swidget. ☜ and it looks like the picture to the left. Or, just click here where I have it bookmarked. "Check if there's a Swag Code"
will pop up in the middle of the Swidget. Click on that blue button, and the message will appear. Remember that sometimes the code is dynamic - which means it changes every 15 seconds. So it helps to have two browser tabs open, one for the code and one for the Gimme box. Then just copy n paste, making sure there are no spaces before or after the code, sometimes the cursor adds them. If it still doesn't work, refresh the code and try again. NOTE - Codes usually look something like this: FaKE2v43COdE (this is NOT the code) Make sure when you copy and paste the code that there aren't any spaces on either side of the code. 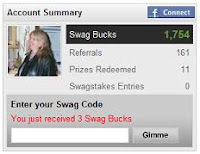 Then take it to the SwagBucks.com home page and enter it where it says "Enter your Swag Code" and click the "Gimme" button. If you have the right code, it will then say "You just received 7 Swag Bucks"! Note that if you're caught by Swagbucks distributing, sharing, or posting active SwagCodes, your account will be deactivated. Then make sure to read my daily Winning Ways with Swagbucks posts to learn how to get the most out of Swagbucks! What? You haven't signed up yet?? Sign up today if you love free money! Are you doing your 1 SBs dailys? That's 150 easy SB every month! Earn 12SBs for clicking thru the "View Our No Obligation Offers And WIN Swag Bucks", I just read each offer carefully, clicked on "Skip" or "No" or "See Next Offer" for anything I wasn't interested in, and you can do this every single day to earn SBs! Next there are Special Offers, Surveys, Tasks, Swago, Referrals, Trade-ins, uploading pics & videos of your Swag prizes, etc. - and of course Swag codes.